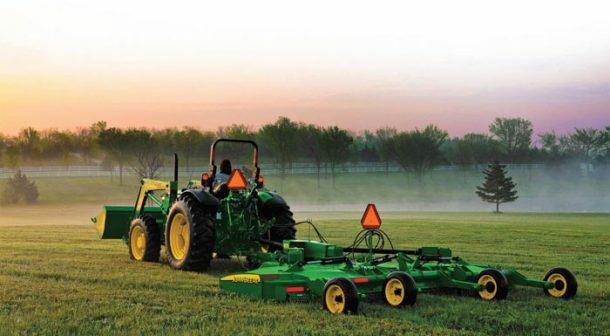 With proper maintenance, compact tractors are incredibly reliable. Still, once in a while, you’re probably going to have an issue. Some problems are relatively minor and can be fixed in a few minutes, and others are indications of more serious repair needed. Here’s what to look for when the most common things go wrong. 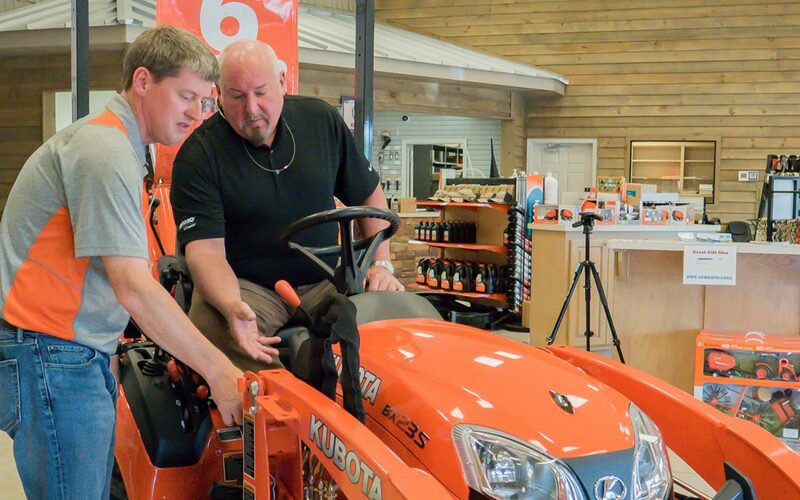 Note: this is general advice, compared and compiled from John Deere lawn tractor troubleshooting, Kubota tractor troubleshooting, and other sources. Your owner’s manual may have model-specific advice. Engine Issues: Your compact tractor engine is hard to start, won’t start, or starts and then stalls. The fix: Check the tank, hoses, fuel shut-off valve, and fuel filter. Look for leaks, verify that there’s fuel in the tank….sounds silly I know but it happens all the time! If the tank is full and there are no leaks, changing the fuel filter may fix the issue. If you still have a problem, you may need to clean or replace spark plugs or fuel injectors. Stale fuel – more than 3 months old – may also cause problems. Wrong engine oil viscosity. In colder weather, oil viscosity increases, which can make your engine sluggish. The fix: You may need to use a lighter oil during colder months. Make sure your cold start system is engaged and working. Levers in wrong position. For safety, each model has specific starting positions for levers, brakes, and gears. The fix: Make sure all levers, gears, and brakes are in the proper start position and your PTO is not engaged. The fix: Clean the battery cables & terminals, then charge the battery. Note: In cold weather, remove the battery and store it indoors when the tractor is not in daily use. Blown Fuse. When your engine won’t start, it may also be due to an electrical problem. The fix: Replacing a blown fuse is an easy task. For more complicated repairs, you’ll probably need to take it to your dealer for repair. Black exhaust. If your compact tractor is belching black smoke, something’s wrong. It may be due to too much oil, a clogged air filter, or dirty fuel. The fix: Check oil levels, replace the air filter, and, if necessary, drain and replace the fuel. Blue or white exhaust. This may indicate fuel inside the muffler, a clogged fuel injection nozzle, or poor quality fuel. You may also have a defective thermostat, which will require service. The fix: If your tractor has not been used in a while, there may be sediment in the fuel or the fuel may be too old. Drain the fuel tank and refill with fresh fuel. For muffler or fuel injector issues, you may want to take it in to your dealer for service. Overheating can cause major problems. If it happens, shut off the engine, let it cool down, and perform a few basic checks. The fix: Flush the coolant system. The fix: Inspect the belt for wear and tension, replace if necessary. The fix: Clean radiator fins and grille screen. Be careful not to damage fins. Low steering fluid. In most new tractors, the steering fluid is part of the hydraulic system. Make sure your hydraulic oil is at the proper level and look for leaks. The fix: Add fluid as necessary and idle the engine for a few minutes to warm up the oil if the weather is cold. Low tire pressure. You can’t steer properly with too little air in the tires. The fix: Check your tire pressure and fill properly. Needs lubrication. Your steering linkage and all moving parts of your tractor need regular lubrication. The fix: Lubricate the steering linkage. Note: it there’s too much play in the steering wheel, or you have a bent wheel spindle, call your dealer for service. Many of these issues can be avoided with daily and regular maintenance. Take care of your tractor and it will take care of you! And remember, you can count on us for all your compact tractor maintenance and repair needs.